Piotr is the Chairman of our partner in Poland, BIGRAM. He is a graduate of the Faculty of Law at Warsaw University and postgraduate studies in Human Resources Management in the US and UK. His expertise is in strategic business development and conducting selected projects for top executives. 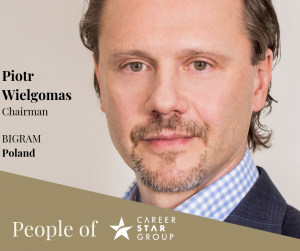 Piotr established BIGRAM, one of the most recognizable Polish HR consulting companies, 25 years ago. He developed a company based on partnership relations, high quality services, and passion to help people throughout their careers. Today BIGRAM is a team of over 50 highly effective individuals, who together create a very strong company focused on HR services. BIGRAM’s head office is based in Warsaw, branches in Wroclaw, Cracow, and Poznan. In his spare time, Piotr enjoys jogging, and history of economy, as he is an avid collector of historic documents and books. He’s is happily married and a father to three dynamically growing children.